When the weather is gross, there’s something comforting about a nice bowl of pasta. It seems to warm your entire body with every bite. So after a snowy afternoon spent Christmas shopping, my husband and I decided to try a restaurant that had been recommended to us on many occasions. Red Hen (1822 1st Street N.W./theredhendc.com) is an Italian/American restaurant located in the vibrant Bloomingdale neighborhood. With a fantastic wine list as well as creative and delectable modern Italian dishes, this cozy restaurant turned out to be the perfect location to hunker down and spend this stormy evening. Proprietors and longtime friends Michael Friedman, Michael O’Malley and Sebastian Zutant joined forces to bring this sophisticated establishment to the city. The rich tones of the rustic wood throughout the space create a warm and comfortable restaurant that does an excellent job complementing the food. Chef Friedman has spent a great deal of time cooking and eating around the world, including in Italy, Greece, Turkey and Northern Africa. 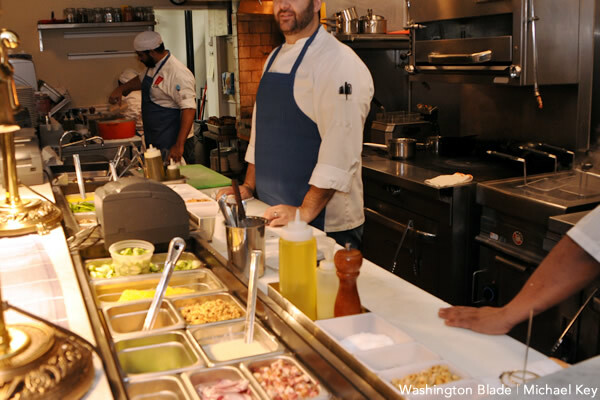 He perfected his craft in the kitchen at Proof under the tutelage of Chef Haidar Karoum before opening Red Hen. When we arrived, we were welcomed by a charming hostess who brought us to our table and handed us our menus, and then our waiter Brendan assisted us in selecting the perfect red wine for the night. We agreed upon the Mediterra Poggio Al Tesoro super Tuscan. The wine list at Red Hen is impressive, so we appreciated the assistance. Brendan was a helpful and attentive server the entire evening, without being intrusive. As a starter we selected the smoked ricotta crostini with balsamic brown butter and truffle honey. We loved the crunch of the crostini, the creaminess of the ricotta and the touch of sweetness that the honey gave the entire dish. As we devoured our appetizer, we began thinking about what we were going to have as a main course; there were many dishes that piqued my interest. However, I really was in the mood for pasta, so I selected the Mezza Rigatoni with fennel sausage ragu and pecorino Romano. Greg decided to have the caramelized scallops with soft polenta, Brussels sprouts, bacon and balsamic. The rigatoni in my dish was perfectly al dente and the full-bodied flavors of the fennel sausage ragu made it one of the best pasta dishes I have had all year. It’s amazing what a simple dish that is so elegantly prepared can achieve. The caramelized scallop dish was equally impressive. The scallops were beautifully cooked and had a velvety smooth texture that slowly melted away and enveloped your taste buds with their fresh flavor. The creamy richness of the polenta was an excellent counter to the lightness of the scallops. We sat back to briefly stretch our stomachs when Brendan reappeared and asked us if we would like to see the dessert menu. After experiencing what the kitchen could create for the savory side of the menu, there was no way that I was going to miss the opportunity to try the sweet creations. Upon seeing the menu we knew that the proper dessert choice was the chocolate cake with fudge sauce and a white chocolate and peppermint gelato. This dessert was every bit as amazing as we anticipated and it was great way to end our culinary adventure for the evening. Usually when I want beautifully prepared Italian cuisine served up by a knowledgeable wait staff that is always smiling, I go to Ristorante Posto, but the Red Hen may steal me away from my regular stomping grounds at times due to the impeccable dishes and friendly service I experienced. I would never abandon you Posto, you may just see a tiny bit less of me.